One of the most prominent personalities in blackjack world was Peter Griffin, a famous mathematician and a brilliant blackjack theoretic. Born in 1937, he left his native New Jersey and was growing up in Williamsport, Pennsylvania. After graduating from Portland State University he went to University of California, where he achieved Master’s Degree in Maths. After getting degree at University, he started to teach mathematical courses of algebra, differential equations, calculus and statistics. This happened in 1965, and twelve years later he achieved a degree of professor and proceeded to teach students. While preparing to teach the course of gambling mathematics, Peter Griffin happened to enter casino in Nevada where he was going to conduct a little research on the subject he was going to teach. As a result - absolute loss of all the bankroll made him swear to himself that he would take his vengeance on. Being a man of a word, Peter Griffin dedicates his life to the research of mathematical methods of taking advantage over the casino. Being a smart and prospective scientist he made a full and complex analysis of all the kinds of games, rules and players achievements referred to blackjack, and his merciless conclusion resulted in publishing The Theory of Blackjack: The Complete Card Counter's Guide to the Casino Game of 21. This book turned out to become a nightmare for casino owners because though it was rather difficult and required knowledge of higher mathematics to be known, it completely revealed principles and methods with means of which it became quite possible to take advantage from casino and bend it on player's side. In the book basic strategies are explained, and those strategies feat to any number of decks and any kinds of rules variation, because they refer to principles of mathematical calculation behind any blackjack rule variation. Also it explains how to break any card-counting system earnings into two main factors: Betting Correlation (BC) and Playing Efficiency - PE. 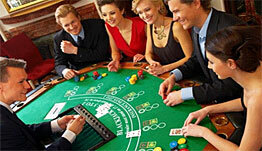 This approach allows evaluating any kind of card-counting system by just comparing its BC and PE to the others. It seems strange, but Peter Griffin never became a popular blackjack-winning casino player. He still went on with his mathematics teaching and left the winning practice to the others, who appreciated his work. In fact, Theory of Blackjack was not his only study on blackjack game: he also published "Extra Stuff: Gambling Ramblings", and a huge amount of magazine and scientific articles. His lively wit and humor is still remembered in California State University, where he taught people until his death in 1998. Peter Griffin is one of the most prominent figures in blackjack history and Blackjack Hall of Fame.